Instructor of the Oplomachi [lies here]. 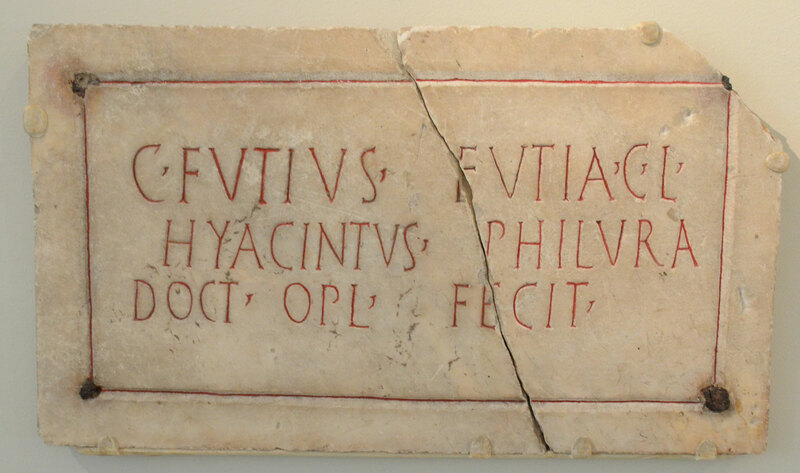 This columbarium slab marked the tomb of Futius Hyacintus who was an instructor in a gladiatorial school. He appears to have trained the Oplomachi, a specific type of gladiator. Not much is known about the equipment of these fighters, but they may have been similar to the Samnite type. Samnites fought with a sword, and were protected by a rectangular shield, greaves, and a helmet. The tomb was set up by a freedwomen of his, by the name of Futia Philura. The inscription is dated to the first century C.E., and was found in Rome. The inscription is also related to an epitaph for another gladiator trainer named Gaius Futius Philargyrus, also in the museum collection. P. Sabbatini Tumolesi, Epigrafia anfiteatrale della Occidente Romano I: Roma, Rome: Edizioni Quasar 1988, p. 61, no. 57; Table XVII fig 1. H.L. Wilson, “Latin Inscriptions at the Johns Hopkins University III,” American Journal of Philology 30 (1909), 153-170, 170.